Budget & Stash Stretchers – Welcome! I thought I’d put a wrap on the holiday sharing the next couple of days leading up to Christmas. I created today’s card for a December swap. I love My Favorite Things Stamps or MFT for short & decided I really wanted to be an affiliate for them too so I got some new goodies in to play with recently including the BB Polar Bear Pals set. Isn’t he cute? 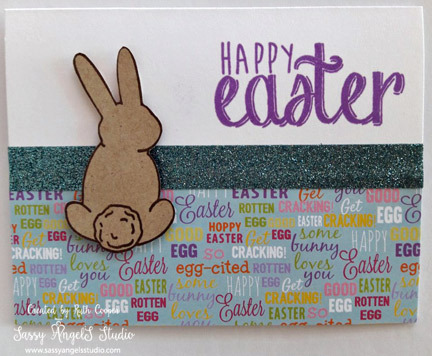 True to my clean & simply styling, it doesn’t always take a lot to create a fabulous card. Cut a Whip Cream Card base 5 1/2″ x 8 1/2″ & fold in half. Add a Whip Cream mat 4″ x 5 1/4″ sprinkled with Sparkle Silk on card base. Stamp & color waving bear, die cut & pop up on card. 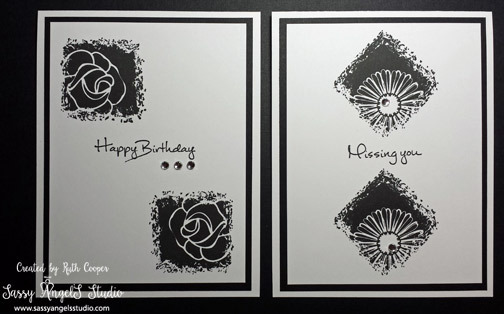 Die cut sentiment of choice & adhere to card. I used Simon Says Stamps Christmas Blessings paired with MFT retired Peaceful Greetings. All done, quick, fun & elegant. Don’t forget to head on out to see some Christmas lights or cozy up by the fire & relax. Share the joy of the season. It’s time for another inspiration share & a quick update on The Puppy Love Project Craft Show. Considering I have been out of the craft show market for some time, it was exciting to sell 6 items so far, especially since they benefit one of my favorite animal rescues. There are still several journals available & the Winter Wonderland wreath if you’d like to purchase an item & help. Check them out on my Facebook page. Thank-you for the support & encouragement in this adventure! Today’s card is a CASE (copy & share everything) from the Spellbinders website gallery. I did not have the arched die they used, but I did have the Arched Elegance Die & the Layered Poisettia Etched Dies. Lovely! I always like white on white and the pop of color from the poinsettia is perfect. Cut a Whip Cream card base 5 1/2″ x 8 1/2 ” & fold in half. Die cut 2 arches from Whip Cream cardstock & adhere to card. Stamp Merry Christmas from Sparkle Trim set in Clear Pigment ink & emboss with Silver Embossing powder. Die cut Poinsettia flower pieces from Turbo Teal, brush edges with Catalina Splash & layer onto card. I did not like to big leaf in the die set for this card, so I found a smaller leaf to use on the card & die cut from Kiwi Slice & used a Stylus tip to create the leaf veins on a foam mat. I used a small round paper punch to punch 3 tiny circles from Silver glitter paper for center of flower. Elegant doesn’t have to be complicated. If you see something you like but don’t own or don’t want to purchase the needed supplies, take a look at what you do own that might give you the same type of look using the supplies you already have on hand. Have a Wonderful Weekend as we head into December’s holiday excitement! Are you ready for turkey day this week? I hope you have an amazing holiday with family & friends! Right after Thanksgiving we will be getting ready for Christmas. I have already seen a few decorations up around town & some have started their Christmas shopping. And then there are a few humbugs floating around too. Got to love them all. This week’s card has a retro vibe & I used a lot of stuff from my stash. You can still be very creative with limited supplies or the supplies you already own. You don’t always have to purchase new stuff. So I hope this card inspires you to take a look at what you already may have on hand to create with. This card is sure to bring lots of smiles! Let’s take a look at how I made it. Cut a card base from Turbo Teal cardstock 5 1/2″ x 8 1/2″ & fold in half. 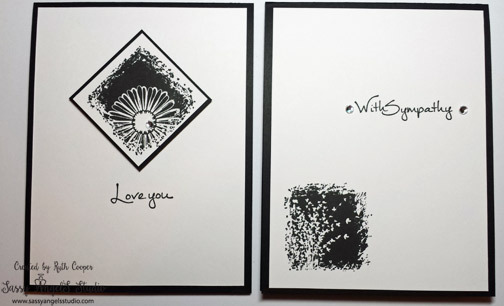 Take a Whip Cream mat 4″ x 5 1/4″ and splatter it with Sparkle Silks. I custom mix my colors. (Pro tip – When a Sparkle Silk bottle has about a third left in the bottle is a perfect time to mix colors. Or I have even bought empty nail polish bottles on Amazon for about $1 each & mixed in them.) I used regular Sparkle Silk, Turbo Teal regular Silk mixed with Sparkle Silk, Candy Apple & Limeade Splash Liquid Colors mixed with Sparkle Silk to splatter this background. (Pro-tip – When you find a formula you like, mark the bottle top with how many drops of color you added to achieve the color you like and label the bottle with the color used.) Set aside to dry. Using Panpastel Colorless Blender, brush corner for sentiment. Stamp sentiment in Limeade Splash & then again in Clear Pigment. Emboss with custom Journey Clear embossing powder mixed with Sparkle Dust. This sentiment if from Unity’s Cheerful Prancing set. Die cut swoosh from Watermelon Fusion cardstock. 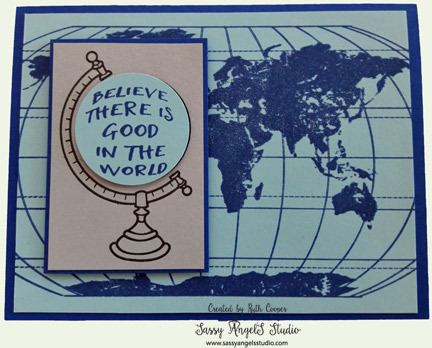 Unfortunately the Contemporary Circle die from Spellbinders is retired but you could easily use a curvy border die & some circles to create a similar effect. Die cut snowflakes in Bubble Gum, Limeade Splash & Turbo Teal. I used FSJ Snow Blooms & a tiny set I have on hand from Penny Black. Glitter snowflakes with Sparkle Dust. Adhere die cuts to card. We invest a lot into our supplies. 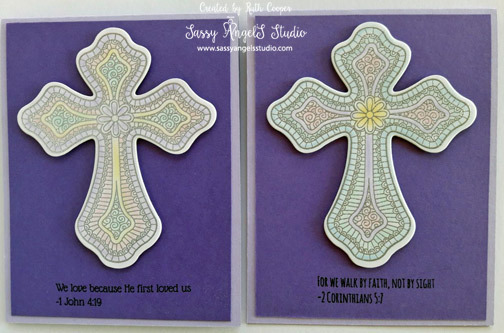 Next time you are flipping through your dies & stamps, see what you might be able to design with them. There was an old saying in the stamp world many years ago that said before you buy a stamp set, you should see if you could create at least 3 – 5 different projects with it to make it worth the cost of getting the stamp set. See if you can look at your stash with a fresh view point & then have fun creating! Find some time to be creative this week, art really is the best therapy. It brings joy to you and the one you are creating for. Welcome back to my blog & the Amazing Journey Blog Hoppers Hop! This month our theme features the Beautiful Wings Stamp Set. If you arrived here from Christine’s Blog you are right on track. If not, no worries, just keep hopping along until you come full circle. I love butterflies & this set is so versatile. I chose to make a holiday card with the Beautiful Wings set & the Geo Burst Die. Thinking outside the box stretches your creativity. You don’t always have to have a large selection of holiday stamps to create fabulous cards. White on white is so elegant & adding a touch of silver gives it pop. I added in some Journey Sparkle Cuts for holiday shimmer. 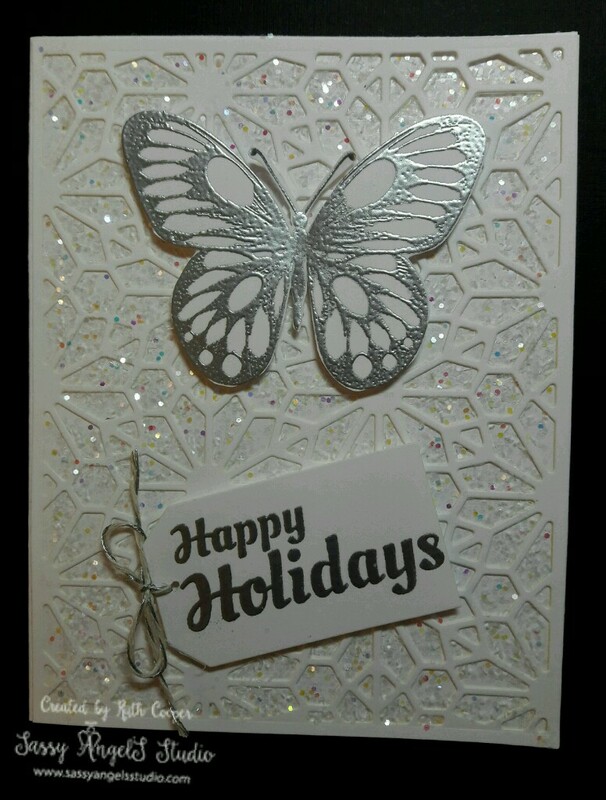 I used Beautiful Wings SS – 0353, the sentiment is from Robin Holiday SS-0378, Geo Burst Die DI-0217, Whip Cream Cardstock, Journey Sparkle Cuts, Journey Silver Embossing Powder, Journey Thread Silver & Journey Foam Squares. Your next stop on the hop is Becky’s Blog. Thank-you for stopping by today. Do something creative this weekend. Welcome to my 2nd Blog Hop. This time we are featuring limited supplies & it’s a short hop. You should have arrived here from Susan Berg’s blog. 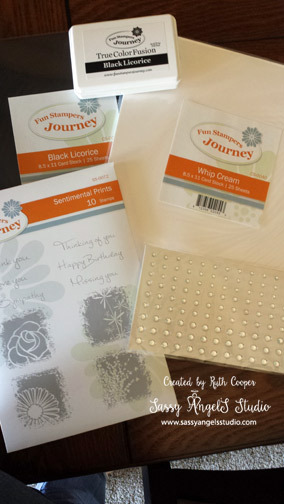 I used Black Licorice cardstock CS-0003 $6.95, Whip Cream cardstock CS-0040 $6.95, Black Licorice Ink IP-0041 $7.95, Sentimental Prints stamp set SS-0072 $19.95 & Cut Rhinestones AC-0023 $4.95. If you were to order these, the total before S&H and tax would be $46.75. You could easily make over 50 cards just with these supplies. Definitely a budget & stash stretcher. I love designing black & white cards. With black & white you can design classy, elegant or clean graphic cards in a snap. 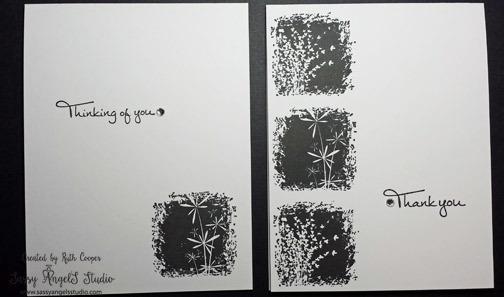 It would have been easy to design a dozen cards with this set but since the Sentimental Prints Stamp set has 6 sentiments perfect for several occasions, I decided to limit myself to 6 cards. The 1st two cards are “no layer” cards meaning there is only a card base used for the design. The 2nd set of cards feature a 2 layer card & a 4 layer card. Building layers adds dimension & interest. The final set of cards feature 3 layers each. Once you have a great set of basic designs, you can build a stash of cards in no time just by adding 1 or 2 items at a time to your limited stash. For example if I purchase an embossing folder, I can expand these designs by adding in that texture to the backgrounds & build with more layers. If I purchase 1 or 2 of my favorite colors, I can then add to these designs by adding a pop of color to the black & white. 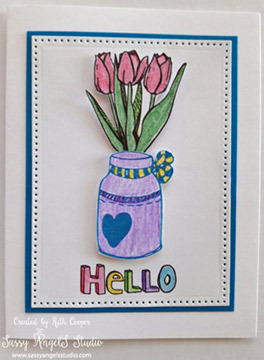 You don’t have to break the bank to start creating wonderful cards. It is very easy to adapt to your budget & slowly build your stash. Before you know it, you will have plenty of items to make a wonderful variety of cards with. I always encourage my 1st time customers to only buy what they really love, maybe something they collect or speaks to them like butterflies. Then I tell them to buy their favorite colors & it’s usually a good start without being overwhelmed and feeling that they have to buy it all right away. Half the fun of creating art is the new toys you get to play with so work within your budget & enjoy each new purchase. Thank-you for hopping by today. Stay tuned for the March blog hop coming up in a couple of weeks. I might be offering some blog candy next round. Please hop on over to Michelle Rothman Greenfield’s blog and see her wonderful creations.